Please contact me to inquire about small group and private classes tailored to your experience level. All tuition and fees are payable by the beginning of class. Cash, checks and major credit cards accepted. Class size is limited. Please call or email me in advance to ensure your place in class. Give the gift of art! Gift certificates are available for all classes, including private lessons and group parties. Contact me for details. I personally teach all the classes offered by my studio. As an art director for most of my career, I have in-depth experience with art, color, layout, and design. I am currently an active studio artist and I am also an authorized meditation guide which inspires my instruction in drawing and art journaling. Most classes are held in my studio at the Screw Factory in Lakewood, 13000 Athens Ave., Studio #C322 on the third floor. Click here for map and directions. Private lessons can be arranged for other locations. A Creative Night Out With Friends or Your Own Private Art Class! With two or more friends you can design your own custom art class at FirstHand Studio. This is a great birthday party idea, friend’s creative outing or family bonding time. Or, design your own private custom art class for one or two people. I am happy to coordinate with you on scheduling a custom art class. Classes may be arranged for days, nights or weekends. Note: custom art classes are subject to scheduling constraints. I recommend contacting me at least 1 month in advance for booking a custom art class. *Additional material fees may apply, depending on the class. Multi-class discount options are available. Your custom-designed art class will go at your pace and focus specifically on your interests and creative goals. I can accommodate ages 10 and up and any skill level. All you need is the desire to create! Students under the age of 15 must be accompanied by an adult (18+ years). TO SCHEDULE A CUSTOM ART CLASS: Please contact me at 440-376-9579 or email me. Please call ahead to arrange for accommodations for disabled individuals. If you see a class you like, but it's not currently offered, please contact me to find out how we might work something out. In this class we will explore how to create an art journal. You will get to try out different materials, pens, paints, adhesives and techniques. Start making the first pages in your own journal and learn how to overcome “first-page jitters.” You will leave with a good start in your own journal and guidelines and inspiration to keep it going once you get home. In this class you will use inspiring quotes, guided prompts, as well as your own thoughts, to create dynamic art journal pages that will document and explore your personal creative journey through life. This is a great class to take on an ongoing basis to keep working on developing your journal. If you can print, you can create whimsical creative handlettered headlines for your journal or scrapbooks. Put away those expensive cookie-cutter stencils and stamps and create your own personalized lettering alphabet. By the end of this two-hour class you will have developed your own unique style of handlettering using only pen and pencil. Learn the basics of color mixing. Gain the confidence to mix your own colors and save money by not having to buy so many tubes of paint. If you have not experimented much with color mixing before, this is the place to start. You will make a basic color wheel to take home. Do you wonder why you get a muddy brown when you are trying to mix a vibrant violet? Or are you frustrated about how to get the right shade of green? Learn the modern secrets of the “Split Primary Palette.” In this class, we will expand on the traditional color wheel and learn how to accurately mix the color you want. You will make your own split primary color wheel to take home. Have you always wanted to be able to draw? You can, even if you think you can’t draw a straight line. This class will get you started and provide you with the confidence to finally begin drawing. In this session, we will do a series of guided drawing exercises specifically designed to break through roadblocks and help you uncover your natural drawing ability. You will be surprised at what you can do! By the time we are teens and adults, we pick up perceptual shortcuts that can actually interfere with our natural ability to draw. 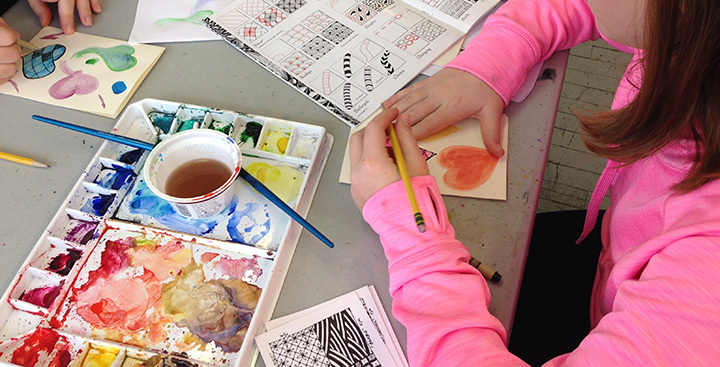 In this class, through guided drawing exercises of everyday objects, we will explore ways to relax and let go of these preconceptions and make a direct and natural connection between what we see and what we draw. Have you ever struggled with trying to draw realistically? Learning just a few simple rules of perspective can dramatically improve your drawings. It’s not difficult once someone shows you how. We will learn and practice these basics so you can draw houses, cups, and other objects that don’t look crooked!